BANGKOK: Thailand has ranked 34th in the newly released biannual “Global Real Estate Transparency Index (GRETI) 2018” compiled by property consultancy firm JLL. In the previous issue of the index, in 2016, Thailand ranked 38th, the notes the report. “Compared to the other six countries from Southeast Asia covered by the Index, Thailand is ranked the 3rd most transparent real estate market in the sub region followed by Indonesia, Philippines, Vietnam and Myanmar that were ranked globally 42nd, 48th, 61st and 73rd respectively,” a release announcing the report said today (June 28). The 10th edition of the Global Real Estate Transparency Index (GRETI) contains the most comprehensive country comparisons of data availability, governance, transaction processes, property rights and the regulatory/legal environment around the world. The 2018 Index covers 100 countries and 158 city markets, and the number of individual factors covered has increased by 36% to 186 factors, said the release. “Transparency across Thailand’s real estate markets has continuously improved over the last decade thanks largely to increased availability of and access to market data,” said Suphin Mechuchep, Managing Director of JLL’s Country Management team for Thailand. “While the growth of listed companies and real estate investment vehicles has contributed a lot to improving financial disclosures, greater regulatory enforcement, the planned introduction of a new property tax system and steps to digitise its land registry will underpin the country’s improvement in real estate transparency further. The improved level of transparency represents a sign of growing maturity of Thailand’s real estate market, Mrs Suphin added. “It helps owners, investors and occupiers identify opportunities and anticipate challenges more accurately, and consequently make better real estate decisions,” she said. Asia-Pacific’s mature economies such as Singapore, Hong Kong and Japan, have a significant opportunity to advance real estate transparency through proptech adoption, noted the JLL report. Such leading investment destinations are on the cusp of the “Highly Transparent” tier and are poised to join the top group, which includes countries such as Australia, New Zealand, the US and the UK, it added. “The proptech sector is growing fast, especially in Asia, though adoption is still relatively low compared to North America and Europe,” explained Jeremy Kelly, Director, Global Research, JLL. “We believe the Singapore government could play a key role in promoting proptech adoption through open-data initiatives and the pioneering of blockchain technology. “The potential benefits of proptech are certainly not limited to transparent markets. It could also help improve transparency in semi-transparent markets like China, which has a vibrant proptech sector, and where traditional data sources are lacking,” he added. Another key area of potential improvement for both Singapore and Hong Kong is in sustainability transparency. Strengthening energy efficiency requirements, carbon reporting and stricter energy consumption disclosure will help them make the step up; and in this regard, they could emulate Japan, which has become a global leader in sustainability transparency, the report highlighted. 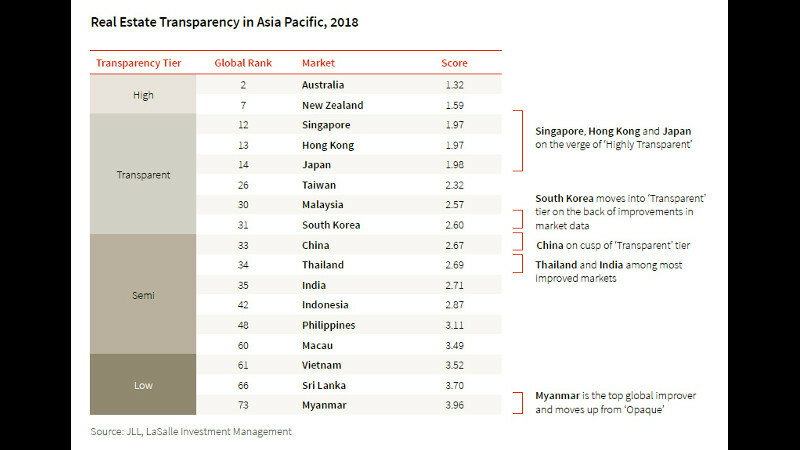 Myanmar has registered the most significant improvement globally, moving up 15 places to join the “Low Transparency” group. According to the report, the country continues to open up its economy as increasing investor demand translates into greater market intelligence. For the first time, South Korea has nudged into the “Transparent” tier, with heightened investor activity pushing improvements in data coverage and a new carbon emissions trading scheme. Overall, progress has been made on sustainability transparency across the region, the report also noted South Korea introduced a carbon emissions trading scheme; meanwhile, Vietnam established its own market-specific Green Building Certification System several years ago and is implementing mandatory minimum energy efficiency standards for all new buildings and major retrofits. Improvements in transparency in some Asian countries have been accompanied by record-breaking commercial real estate investment volumes. In 2017, real estate transactions in the Asia-Pacific region reached a record US$149 billion (B4.929 trillion), the report concluded.